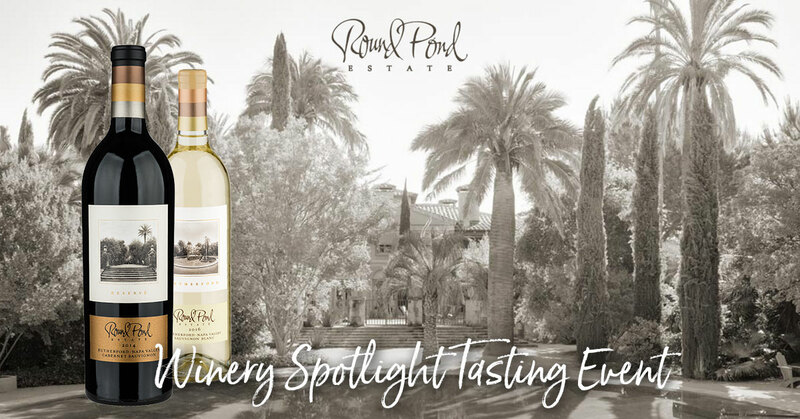 Join us for a Winery Spotlight tasting event featuring Round Pond Estate, from the Rutherford region of Napa Valley, California. Round Pond, owned and operated today by the second generation of the MacDonnell family, is a 468 acre Rutherford farm and winery that specializes in the creation of pure, expressive wines, artisan foods and unforgettable experiences—all from the heart of Napa Valley. In addition to a state-of-the-art winemaking facility and 362 acres of Rutherford vineyards, the estate includes 5 acres of gardens, 12 acres of olive orchards, and one of only two olive mills in the region. Brother-sister team Miles MacDonnell and Ryan MacDonnell serve as owners of Round Pond Estate—a winery, vineyard and olive mill located on Rutherford land their family has owned since 1983. After years of providing grapes for some of the region’s finest wine producers, the MacDonnell family began making their own wine under the Round Pond label with the inaugural 2002 vintage. Miles and Ryan assumed control of the business in 2003, and today Round Pond Estate produces highly acclaimed Cabernet Sauvignon and Sauvignon Blanc from the family’s 362 acre vineyard. They also craft specialty gourmet foods, including fine red wine vinegars, fruit syrups and olive oil. In the 1980s, when the MacDonnell family began vacationing in Napa Valley, they would return home with a gallon container of fresh olive oil. They loved Napa’s farm-to-table way of life and enjoyed recreating it for friends and family. When the MacDonnells moved to Rutherford for good, they knew they wanted to make their own estate olive oil. With help from legendary Florentine mill master Marco Mugelli, they constructed a state-of-the art mill—only a stone’s throw from a grove of 100-year-old Mediterranean olive trees. Today, for every bottle of Round Pond Olive Oils purchased, Round Pond donates a bottle to help fight hunger. They have partnered with Community Action Napa Valley (CANV), contributing to their food pantries and helping to provide over 400 nutritious hot meals daily. In 2000, inspired by the bounty of their vineyards, Round Pond began crafting gourmet red wine vinegars using their our own estate-grown grapes. Crafted using the revered Orleans method, their vinegars continue the tradition of this time-honored technique, which originated almost two hundred years ago. Making their farm-to-table philosophy a way of life, the MacDonnell family enjoys nothing more than sharing the bounty of their farm and vineyards with guests….and we hope you will too! This entry was posted in Winery Spotlight Tastings and tagged local wine event, local wine tasting, napa valley wines, round pond, Rutherford wines, tasting, tasting event, tasting station, wine, wine event, wine portfolio tasting, wine styles, wine tasting, wine tasting event, winery spotlight, winestyles. Bookmark the permalink.